The Author of ‘Connect the Dots’, ‘Follow Every Rainbow’, an entrepreneur and a youth expert!! Satvika- IEEE Kochi Hub WIE Congress has yet another thing to be proud of !! 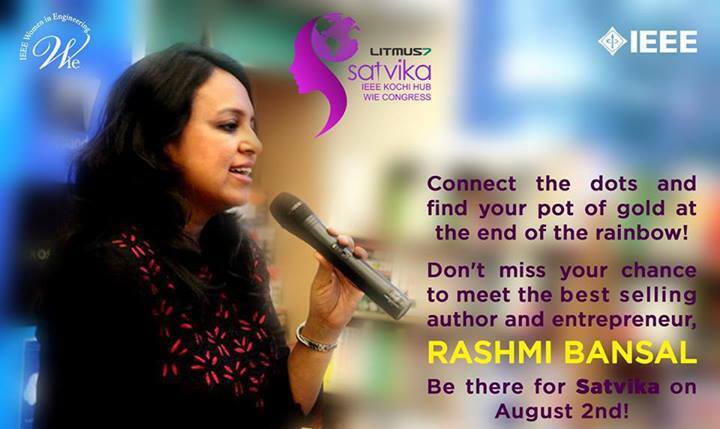 Rashmi Bansal is coming to College of Engineering, Chengannur to share her experiences on August 2, 2013!! Don’t miss the golden chance to get inspired !! This entry was posted in College of Engineering Chengannur, IEEE and tagged Author, Bansal, CEC, CEC IEEE, College of Engineering Chengannur, Connect the dots, Hub, IEEE, IEEE CEC, IEEE Kochi, IEEE Kochi Hub, Rashmi, Rashmi Bansal, stay hungry stay foolish. Bookmark the permalink.